thanks! my daughter loves penguins! Aww! I love penguins, too. That is utterley adorable. Would it be poossible to adapt to DK yarn? I am trying to ‘stash bust’ and have tons of DK. Also, I knot for fund-raising for my grandson’s school – would you be OK with me using the pattern for this? Thank you, Alison. If you need help adapting the pattern to DK yarn, please feel free to contact me. Just use the contact form on my blog, or just reply to the e-mail message I sent you. Would you be able to send me a pattern incorporating the Boston Bruins Logo? I would like to make this hat for 2 little boys for Christmas. Their ages are 7 and 5. Thank you. If you would like me to pay for this please let me know the cost. I haven’t designed a hat using the Boston Bruins logo and don’t have any plans to do so. I also am interested in a Boston Bruins hat. Were you able to obtain a pattern? I doubt that Pat Aubut will see this question. I’d like to add that even if I had designed a hat with the Bruins logo (or Pens logo, etc) on it, I wouldn’t be able to either sell the pattern or give it away because it wouldn’t be officially licensed by the NHL. Now who doesn’t need a hat with penguins?? I’m afraid I just may have to knit a pile of these as gifts for my friends, all of us in our early 60’s. There isn’t enough whimsy in the universe. This is an awesome hat! I take it it’s sized for a child? I’m not the most experienced knitter and I’m not sure my guesses at adapting the pattern would be correct. Would I just have to add a penguin? Or would it be best to add a couple of extra stitches between each penguin? Also, this may seem a silly question, but is there a difference between the colour chart and the alternate colour chart? Final question, the pattern says to do two rows black, three gold, and two black after the ribbing. Then the colour chart has you do another two rows of black before starting with the penguins. Those two rows are not included in the finished hat. Is that an error? If I did all the rows of black would that help make this an adult sized hat? Thank you so much! Thank YOU for the great pattern! There’s no “child” version, but you could adapt the pattern either by knitting it at a smaller gauge or leaving out one of the penguins and casting on accordingly. Q – Is this because you love the Penguins hockey team? Or, because you just love penguins. 😎 LOL! Adorable hat. Thanks for the pattern. This is SO cute. Added to my Ravelry queue for sure. Thanks. I hope you enjoy knitting it. Please could you assist me in converting penguins galore to double knitting. No. I have never done double knitting, so I really cannot be of any assistance. Sorry. Thank you for your kind words. I think the credit goes to the person who designed the penguin chart that I adapted to the hat. Go Pens!! I always get excited when I find Pens knitting patterns! And I know you’re not an OU fan, but I am, so I am double excited to find a Pens pattern AND an OU pattern on the same site!! Thanks for being awesome! As both a fan of penguins and the Pens, I’m so excited to make this hat for a couple of my Pens fan friends! I haven’t done much colorwork before, so this is probably a dumb question, but what kind of colorwork did you use on this? Fair Isle? Intarsia? Thanks so much! 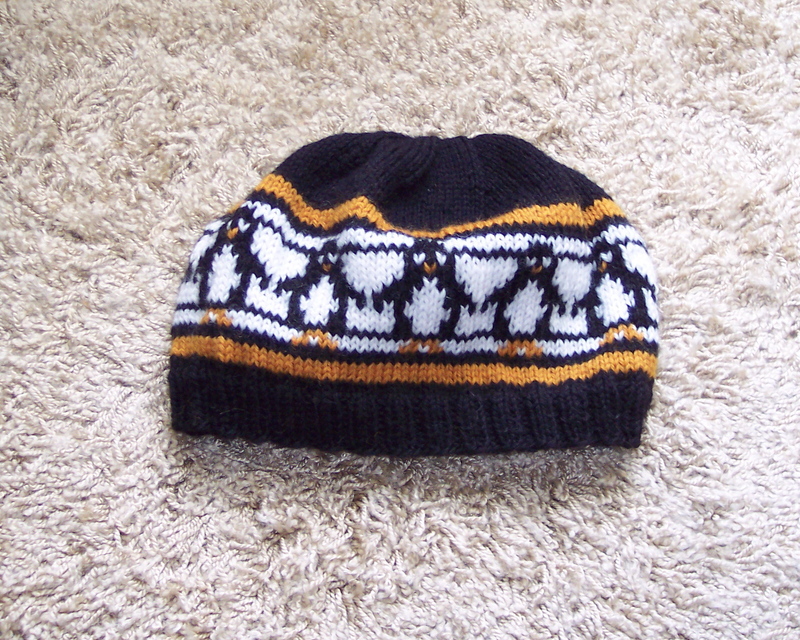 The penguins hat is stranded color work.